French farmers drove tractors through town centres and blocked highways on Wednesday to oppose extra agricultural imports from South America, raising pressure on President Emmanuel Macron in the run-up to a politically sensitive Paris farm show. Agriculture is proving a stumbling block in negotiations between the European Union and the Mercosur bloc of South American countries over a wide-ranging trade agreement, with friction in particular over how much access the EU should give to South American beef. Reports that EU negotiators have increased their offer of market access for Mercosur beef have angered farmers in major European livestock producers such as France who say cheaper South American meat does not meet the same sanitary and environmental standards as in the EU. Concern over the Mercosur talks is adding to tensions in French agriculture, after plans to reshuffle subsidies for disadvantaged farm belts prompted protests in recent weeks, sapping goodwill created by government proposals for fairer farmgate prices. “Mr Macron is keeping his promises on the issue of prices paid to farmers,” Christiane Lambert, head of France’s main farmers’ union, the FNSEA, told news channel BFM TV. 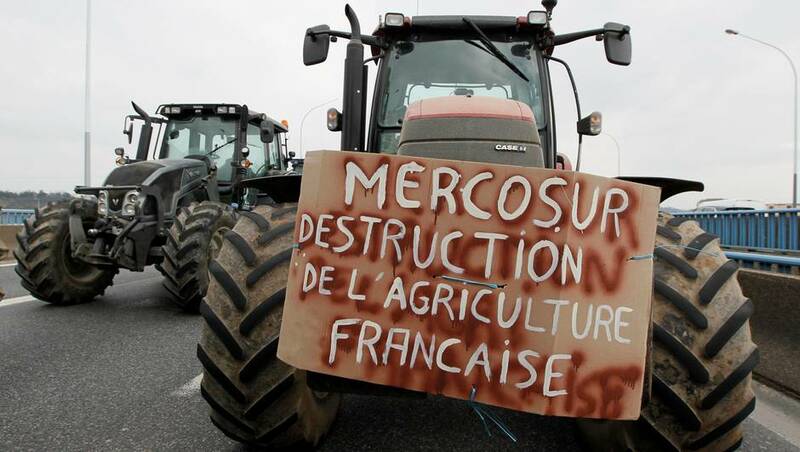 The FNSEA’s local branches staged protests across France, with tractors rolling through towns including Bordeaux and Nantes, displaying slogans such as “Stop Mercosur” and “Macron, betrayal” and gathering in front of government buildings. Small groups of farmers also blocked traffic, including at a busy motorway interchange near the southeastern city of Lyon. The FNSEA estimated that around 20,000 farmers took part in demonstrations across the country. The protests come ahead of the annual Paris farm show, an important political fixture in the EU’s biggest agricultural economy where Macron is due to make the traditional presidential visit this Saturday. As a further gesture, Macron has invited hundreds of young farmers to the Elysee Palace for a reception on Thursday, drawing comparisons with an event he held last year for French mayors amid tensions over funding for local authorities. Agriculture Minister Stephane Travert has said France will seek guarantees for fair competition with South American beef, telling France’s National Assembly on Wednesday these could include an emergency mechanism in case of severe disruption to the EU beef market.